So, it’s been almost a month here in Malaysia and I’ve yet to start with my new job. The process is taking longer than expected, and who knew this is harder than I thought it’s gonna be? When I first signed up to the idea, I thought I’d be spending everyday discovering local cuisine and then walking along the markets for authentic Malaysian goodies on weekend mornings. The fact is when you go live abroad, the first few weeks are dedicated to learning. I’m living independently for the first time ever and have to know basic things (how to use a washing machine, for instance), budget until I have a regular flow of income and essentially adapt to living here. That means grappling with the occasional bout of homesickness and knowing the dos and don’ts, how to get to anywhere, where the cheap eateries and well-stocked groceries are, having at least basic conversational skills. I remember going to this local mamak restaurant and asking the server for a cheese naan. He said it was unavailable and then gave me several other options, none of which I understood. I swear I got beads of sweat because I felt like I was put on the spot… there was no time to google or anything. After I went home, I looked up their menu and searched what “goreng”, “telur”, “nasi lamak” means. Anyway, a few days ago I decided to go out and see Batu Caves. I’d been putting this off since forever because I was too comfortable in our condo. From Bukit Jalil, it took me 2 hours to get to Batu Caves. It’s funny because I live a walking distance away from a train station and Batu Caves is at one end of a train line so it should’ve been a simple-enough route… but the whole train system in Kuala Lumpur is so confusing. Also, pedestrian lanes are almost nonexistent. I already knew this based from living here a few weeks, but then there are highways also, and how are you going to get across to the other side? So it took me later than expected to get here. When I arrived in Batu Caves, I felt relieved, proud and happy. 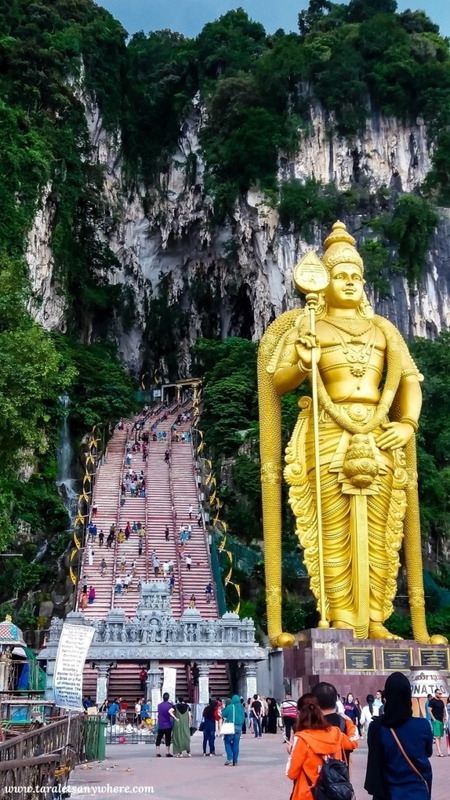 Even if you’re not familiar with Batu Caves, I’m sure you’ve seen a photo of it at one point. 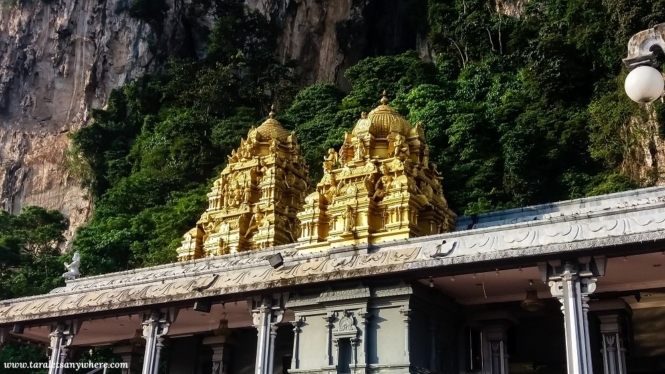 Essentially, Batu Caves is a limestone hill with a series of cave temples. It’s located in Selangor and can be reached by riding a train via the Port Klang line. 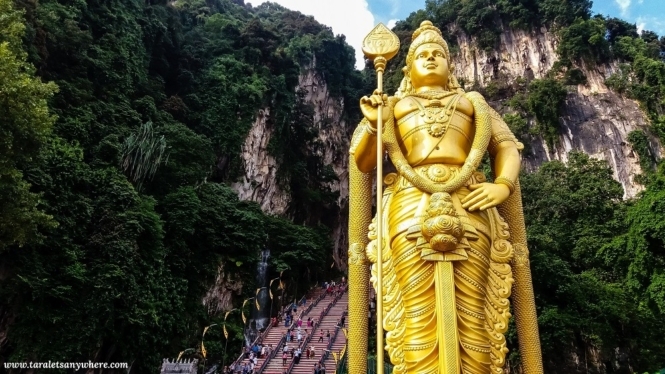 Batu Caves is a Hindu shrine dedicated to Lord Murugan, a god of war. 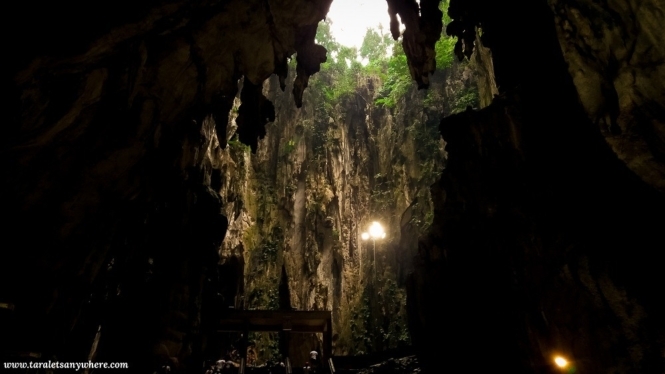 It’s considered by some to be one of the most magnificent caves in Asia. Stepping outside the compound of the train station, I saw intricately decorated arcs and towers over rooftops. 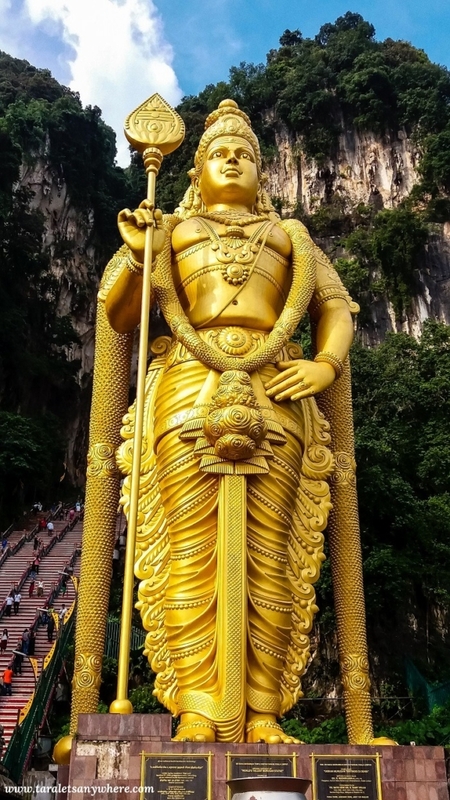 There’s the large golden statue of Lord Murugan, hovering over the entrance to the main cave. On the other side, there’s a natural waterfall. 140-foot golden statue guarding the entrance to the main cave. Golden statue of Murugan, god of war. There was another smaller cave on the side, where tourists can go on an educational tour. Surrounding the Batu Caves are local restaurants and shops, a money changer. There are also rows of streetfood, and even locals who offer palm reading. There are temples inside the cave. One of the monkeys playing around the stairway. Took photos to show to Hali because he loves animals. Some people complain that Batu Caves is too crowded, too touristy, but I love it for this very reason. Here, I feel like a tourist again. I can get lost and not feel stupid, I don’t have to pretend that I’m a wise, experienced expat or I know what I’m doing. I’m just the same with everyone else. 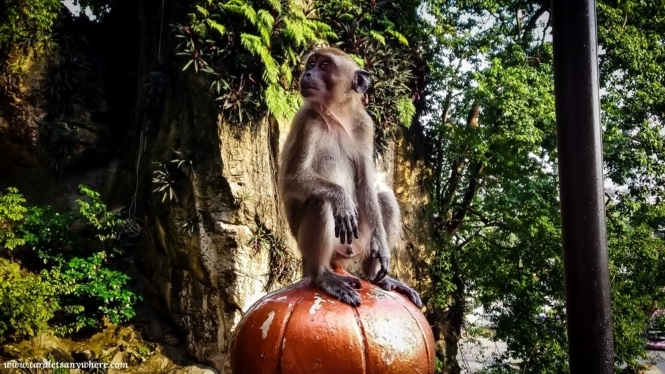 After climbing the 200 steps to the main cave, going inside and exploring a little bit, taking photos of the various monkeys on the way down and trying out one or two streetfood, I went back to the train station and headed to Jalan Alor night food market. I’d already said that I’m in love with Malaysian food, so I was excited to finally visit one of Kuala Lumpur’s food markets. 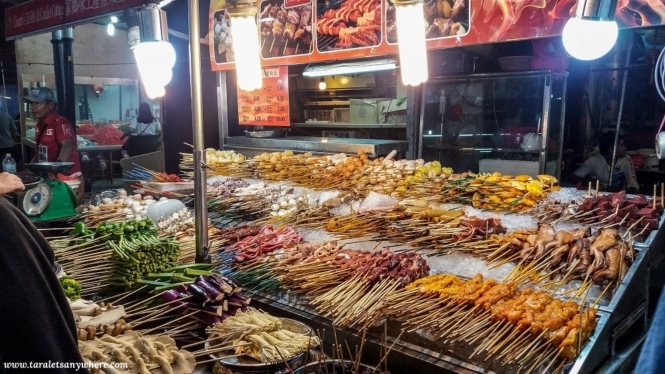 You actually don’t need to go to designated food markets to have a genuine taste of Malaysian cuisine… Kuala Lumpur has a thriving culture of hawker stalls, mamak restaurants and other local businesses operating in its streets. In that sense, Jalan Alor is in fact a more touristy food location. Again, one of the reasons I liked it. Various veggies, meat and seafood for grilling at Jalan Alor. I arrived at past 7PM and Jalan Alor was bustling with locals and foreign tourists. It has this fun, lively vibe. I enjoyed walking around looking at what the stalls offer — fruits including dragonfruit and durian, desserts like cendol and ice cream offered in coconut cups, grilled meats and vegetables, satay and chicken sticks, among others. There are also various restaurants in the area offering Chinese, Malay, Indian and Thai dishes. As much as I’d love to try these food, it seems that a lot of restaurants in the area cater to groups of people. Prices range from RM20-30+ and are good for at least 2 people. I ended up buying a seafood tom yum soup with rice in a small, almost-overlooked food stall and finished it down with a delicious teh tarik. It was rush hour and I had a difficult time booking a ride back home, but overall I love this day. I love the carefree feeling of being a regular tourist again. It made me wonder why being a tourist gets a bad rap. It’s actually nice to be one. Oh i suddenly missed Kuala Lumpur! We’ve been here like 3 years ago and it was a memorable trip with the kids even if it was very tiring. Having to fly from KL to Johor Bahru for Legoland and then back to KL again after 2 days.. we climbed Batu Caves and but we missed the Jalan Alor night food market. Yay! 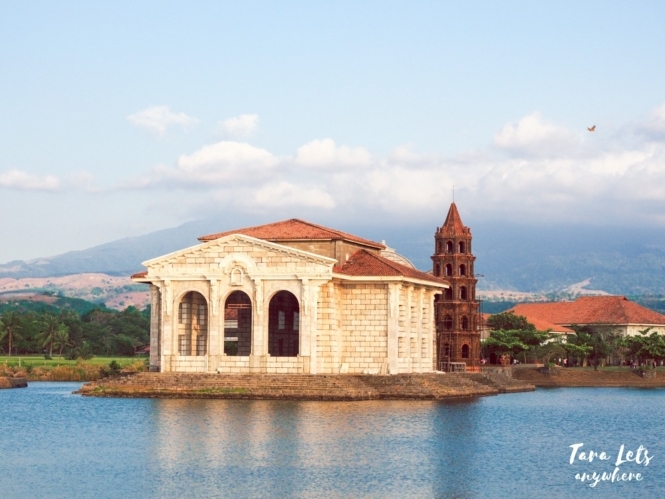 Been wanting to visit it for food trip! I hope we can come again next time without the kids so we can explore more.. Thanks to this post. We’ve been to Malaysia about four or five years ago. And I can’t even remember that place with monkeys and the big Buddha and the birds. And then I chance upon this. So the place is Batu Cave. I just like the concept that caves usually are underneath but here, you need to go up in order to see the cave. Though tiring, the sight upstairs is worth the long climb. Though the monkeys somehow scared me. But nonetheless, the experience was one for the keeps.